I've had a great week: staying binge-free, eating very well, getting my runs in (even though my energy feels zapped), and yesterday, I was pretty proud when I jumped on that box at the rec center. I'm hoping for a week just like it, and today was off to a good start. Amanda just completed her first Disney race this weekend--the Minnie 10K! Disney has a minimum pace requirement of 16:00/mi, and if you aren't able to keep that pace, then you are "swept" from the course. In February 2012, Amanda was at mile 5 of the Disney Princess Half-Marathon when she was swept. That made her extra-determined to finish this 10K, and she trained hard for it. She was very nervous going into it, but she maintained a good pace and finished the race! Now that she's proven to herself that she can maintain the pace, she plans to tackle the Princess Half next February as a redemption race from 2012. In looking back at her 2012 race, she likes to think of this quote from Theodore Roosevelt: "It is hard to fail, but it is worse never to have tried to succeed." "'This isn’t hard, being 320 pounds was hard!'. It’s true. As hard as running the last few miles of a marathon was, it was hard it a way that made me feel alive. It was hard in a way that showed me what I was capable of. It was hard in a way that made me feel completely in touch with my body. When I was 320 pounds, it hurt so much to live with that weight every day, and yet, I was also so numb inside. Yesterday, what I experienced the last few miles of my marathon felt like the absolute polar opposite of that. The other thing that really pulled me through the last few miles was looking down at my wrist because I wore the stop watch that I used when I started Couch to 5k and bracelets my daughters made me. Looking at my wrist reminded me of how far I’ve come and who I was doing this for. Crossing the finish line, looking up and seeing my family cheering for me was amazing! I cried. They put a metal around my neck and I was proud of myself! Sometimes I have a hard time being proud of myself and seeing how far I have come, but yesterday I felt like I was going to burst with pride!" Bergen shared her story on the podcast Half Size Me (episode 87). 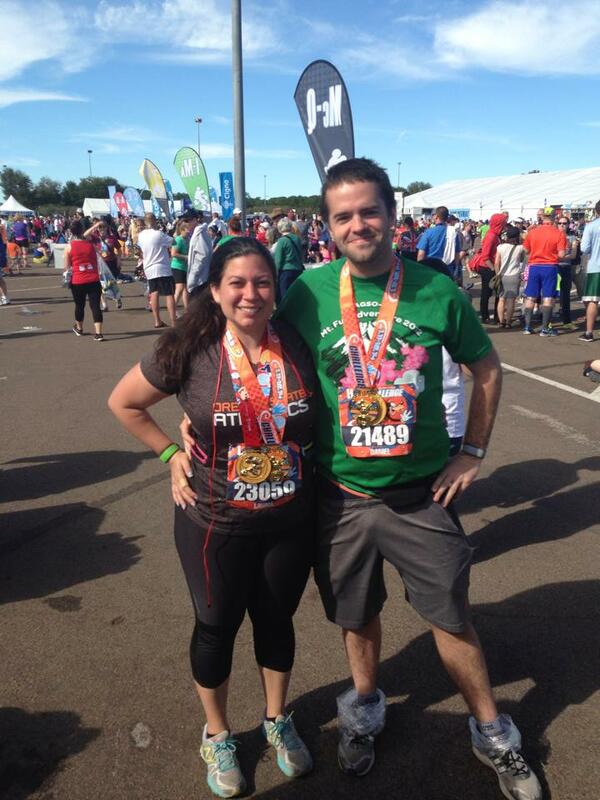 Allison has not only lost over 100 pounds, she also just completed her first half-marathon! 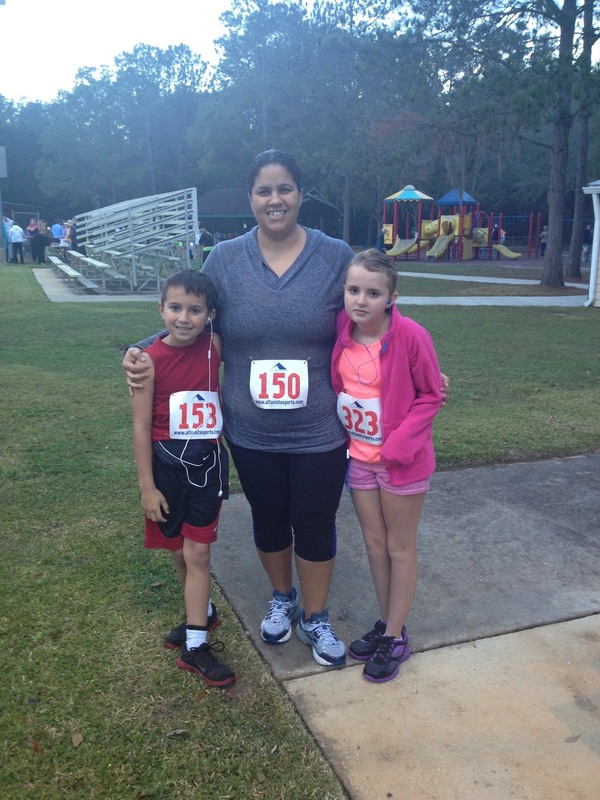 Her daughter ran her second 5K, and she and her son ran the half-marathon together. She's been running for two years now, and her son wanted to start running with her. At seven years old, he ran his first 5K last year, a 10K in the spring, and then begged to do a half-marathon with his mom. They had a great race! Allison said her favorite thing is to stay fit with her kids. Don't forget to check out the Motivational Monday Facebook post for more stories (and to post your own accomplishments)! Yay Laurel! Woot woot! And holy crap, the 7 year old running the half marathon. SUPER impressive! Great job everyone. You're running Ragnar SoCal?! That's awesome! I can't do it this year because my parents are renewing their vows. I did it last year and it was a blast! Wow this week has some impressive accomplishments!! Great Job everyone! Cried. Oh Laurel! And honestly everyone. I'm running my first half this year and no matter the outcome I'm probably going to be a crier lol.